Alleviating families’ burdens after a cancer diagnosis has been the main objective of Cops for Kids with Cancer since the group started in 2002, said Robert Faherty the organization’s chairman and retired Boston Police officer. 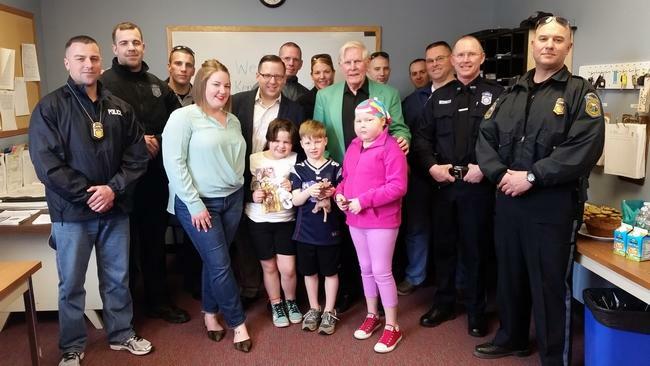 While the family gathered at Scituate Police Department for a check presentation, Robert Faherty, chairman of Cops for Kids with Cancer, turned attention first to Maeve Kendall, 10, who was diagnosed with leukemia last June. Robert Faherty, Cops for Kids with Cancer chairman, jokes with the Kendall family that the organization’s bumper sticker could prevent future pull overs. In her polka dot bandanna and dark pink ‘Chuck Taylor’ sneakers, Maeve Kendall sat coolly on the side of the room while her siblings helped themselves to a few cookies. The 10-year-old was still feeling kind of awesome after Cops for Kids with Cancer, a non-profit based in Braintree, donated $5,000 to her family to help with expenses they’ve faced since her diagnosis last June. Sometimes that money goes to charity staff, sometimes to cancer research, but families are often left out, he said. He called Cops for Kids with Cancer a true non-profit because no one gets paid. The organization helps at least six families each month all over New England. Police officers notify the organization about people in their town who need help. For Maeve, her cancer diagnosis started as leg pain in May 2015, her mother Michelle said. The family sought out medical opinions, had blood work done, visited emergency rooms, and then in June, they learned Maeve had acute lymphoblastic leukemia. She was in the hospital through the end of July, but overall the family has been blessed, Michelle said. ‘The good thing about her diagnosis is it’s curable,’ Michelle said. ‘She has a good prognosis.’ Maeve is about halfway through ‘a really grueling treatment’ meant to take two years overall, Michelle said. ‘Hopefully her strength will get better and she’ll be able to go back to school in the fall in sixth grade,’ she said. Cops for Kids with Cancer invited the Kendall family to Scituate Police Department to make the presentation on Thursday, March 31. Several officers from the station joined the Scituate family to show their support. Before the check presentation, Faherty focused solely on Maeve. He presented her with a stuffed bear, a police pin and badge and some other gifts. He also let her siblings, Kellen, 7, and Fiona, 8, select gifts from a grab bag. Then he gave the family the check, earning hugs and handshakes in return. ‘It makes me feel good knowing I am helping a family with a child that has cancer and is financial difficulty,’ he said. Families with cancer often struggle with paying bills, Faherty said. ‘They lose their homes and have a lot of problems,’ he said. Hopefully, the amount lasts a family three months, he said. Michelle said the costs associated with her daughter’s medical care add up quickly – from gas for medical appointments to insurance co-pays. They are grateful for the help, which is the latest in a string of local support, Michelle said. ‘It’s overwhelming. The whole town really rallied from the start, so it’s unfathomable that more is coming to us,’ she said.